Either intuitively or from reading articles on the topic, we all know that negative emotions are stronger than positive ones and stay with us for longer. The brain handles positive and negative information in different hemispheres […]. Negative emotions generally involve more thinking, and the information is processed more thoroughly than positive ones […]. Thus, we tend to ruminate more about unpleasant events — and use stronger words to describe them — than happy ones. I decided to fight the negativity bias in my life by highlighting from time to time small things that make my life better regardless of the negative things that might be present. “Small Things that Brighten Life” is planned as a series of occasional posts: I’ll write them as I find anything worth writing. I will not limit this series by the topic of perfumes but it just happens to be a theme of the series’ pilot. It seems very appropriate. Two months ago I unexpectedly won an anniversary blog draw at All I am – a Redhead. I say “unexpectedly” because when I left my congratulations I meant to say the traditional “DNEM” but just forgot. The main reason I planned to skip the draw was because I thought something along the line: “We all are testing more or less the same perfumes, why to make Ines to try looking for something that I haven’t tried?” But when I won I couldn’t refuse my luck – especially since there was chocolate involved. I got busy and didn’t write to Ines, she didn’t write to me either and I figured she was busy as well and we would exchange letters at some point. Last week our office assistant (the same guy who sent me a link to Mermaids Past Their Prime a couple of years ago) got a call from a receptionist from the office building in which our company had a lease before moving to the current location: there was a package with my name delivered there. We moved from that building more than two years ago and though on a few occasions I picked up packages from there, I was surprised that somebody still remembered me. But I was glad they did and I promptly retrieved the package. 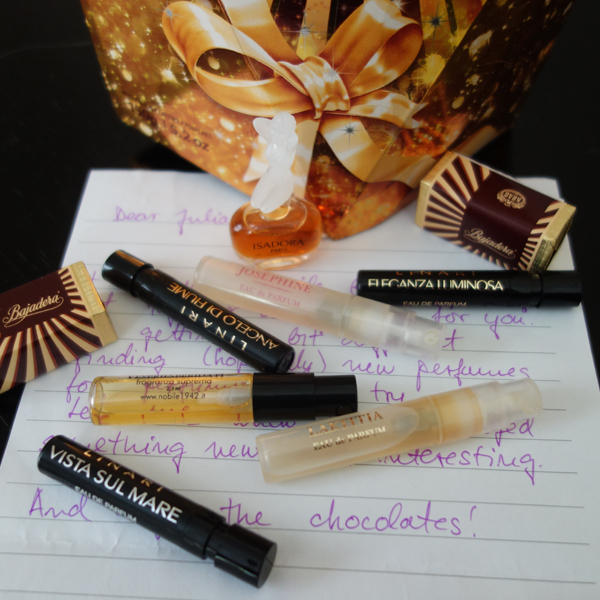 When I got home and opened the package, I was delighted and very pleasantly surprised: not only it contained a box of chocolates but also there were six perfume samples, five of which I’ve never tried (or even heard of) before. Think of it: how improbable would it be for you to send a fellow-perfumista five perfumes new to her/him without any prearrangement? Let’s see! I’ll ask Rusty to choose one of those who comments on this post and will try to guess and send five samples that the winner hadn’t try on skin before (I’m not ambitious enough to go for the “never heard of” part). And some chocolates. Thank you, Ines, for that wonderful double-improbable package! It did brighten my life. P.S. After hitting “Publish” I discovered that this was my 300th post. I take it as one more positive token. The negativity bias, here I come! this is a great idea! If I win, I would definitely do the same! We can start an inter-blogging thread! I am not posting regularly over the last 2 months, but it is surely a chance for anyone, and many more people would be involved, not only the single winner of a single draw! I meant to comment on Ines’ late blog birthday post, but I was late (of course) to the party, trying to balance life between new job, looking for a kid, and looking for another job…Thanks for the chance! It seems life insists on butting in on our hobby! It’s getting harder and harder to find strength for everything we’d like to do. But we should keep trying. Well, I suppose that any of the participating bloggers will succeed in this challenge! What a nice surprise for you!! First, that yhe receptionist from the old office building is/was kind enough to track you down about your package delivered there. Second, that ones sent you five perfumes that you had never heard of…I can see the never tried aspect but I would have guessed that you would have at least heard of them. I just asdume you know all the perfumes out there since its your hobby/passion. My perfume knowledge is mainly limited to what I see at the major department stores or read about in your blog or the occasional beauty magazines. With more than a thousand of new perfumes released per year, every year, it’s getting harder and harder to even stay informed of new brands and releases – let alone testing those. But still I was surprised to get such a high percentage of new for me perfumes. What a heartwarming post and a great series idea to pick, whether it carries on with a perfume theme or not. I think the receptionist at your old building deserves a chocolate too for her conscientious notification of the package’s arrival! ;0 In that photo I recognise Eleganza Luminosa, which is very nice as I recall. Oh, and many congrats on your 300th post – keep ’em coming! Oh, and DNEM, because like Cookie Queen, I am spoilt, also by you. ;) Also by her! Thank you, Vanessa. We’ll see where it leads me but I also liked the idea when it came to me. This is such a great post! I love your decision to highlight the positive in life. What are the 6 samples Ines sent you? I wasn’t quite able to read all the labels in the photo. There were Eleganza Luminosa, Vista Sul Mare and Angelo di Fiume by Linari, Vespri Esperidati by Nobile 1942, Laetitia and Josephine by Rance. Out of these I previously tried only Josephine. Also there was one vintage mini-bottle – Isadora by Isadora Paris. I count it as a pleasant surprise but since I’m not in vintage perfumes, it’s no surprise that I haven’t heard of it before. Would be interested to hear your thoughts on Laetitia. Very woody – or do I mean patchouli-y? – as I dimly recall. Congratulations on your 300th post, dear Undina! What a lovely surprise for you and how nice that the Universe deemed you special as well :-). DNEM but do say hello to Rusty. Congratulations on your 300th post! And “Small Things that Brighten Life” is an apt topic for the milestone, even though it wasn’t intended. ;) As Vanessa said, the receptionist definitely deserve a chocolate or two. What a great idea for a posting series, Undina. You’ve got me thinking that I should do something similar on a personal basis (as in keeping tabs in a journal of the bright things that happen in the course of a day or week) because I’d like to turn the tables on my negativity factor, too. I’ve been on the receiving end of Ines’s Croatian-chocolate packages a couple of times and thoroughly enjoyed the experience. :) :) Cheers to her for sending you 5 completely new-to-you fragrances, which is quite extraordinary (*especially* for you, as you live near lots of great department stores and boutiques). DNEM for the draw, but keep the posts coming and congrats on your 300th!! You should definitely try the positive-things-highlighting therapy: I’m sure it’ll work. I wasn’t sure if I was going to be able to select perfume samples that would be new to you so it makes me very happy to hear I succeeded. You see, Ines, how many positive emotions you’ve brought up? The world is definitely a little bit better because of your blog :) Thank you once again. Undina, congrats on your 300th post!! That’s quite an achievement. And what a lovely package to receive! I’m glad it made its way to you. It doesn’t get much better than chocolate + perfume, this is truly the perfect post for your positivity theme. Lavanya, you’re adorable! :) I would have never thought that you appeared only because of the draw. I’m always glad to see you and can only imagine how busy you are.